The story of Louis Sarno, an American ethno-musicologist who lived among the Bayaka Pygmies in Central Africa for 25 years. Learning how to truly listen is an invaluable skill in life. When we are open to hearing others, we allow ourselves to learn and grow by experiencing different viewpoints, cultures, and ideas. In fact, for the main character of 'Oka!,' listening isn't just a handy tool -- it's a livelihood. As an ethnomusicologist, it's his job to record the sounds and music the he hears in a Central African tribe, and through his journey he opens himself and the audience up to their way of life. Unfortunately, despite these admirable cultural insights, the film can't quite overcome an uneven tone, meandering plot, and wonky dialogue -- making some of what we have to listen to a little awkward to endure. 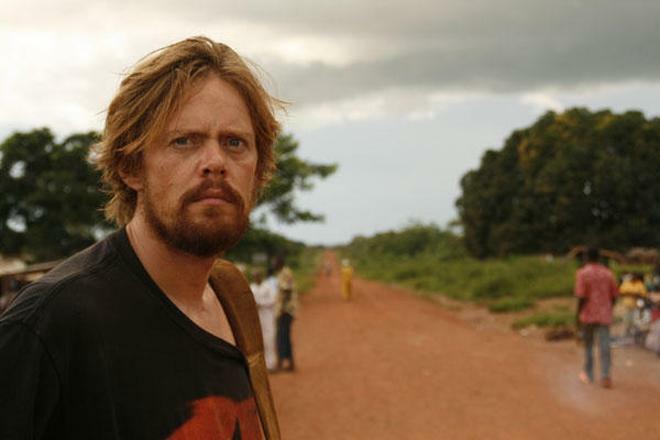 Based on a true story, the script follows Larry (Kris Marshall), an American ethnomusicologist who returns to the Bayaka Pigmies in Central Africa to finish recordings of their music and village. While there, Larry reacquaints himself with the tribe's lifestyle and comes to greatly admire their culture. Sadly, health problems threaten his stay and a corrupt mayor places the village in danger. 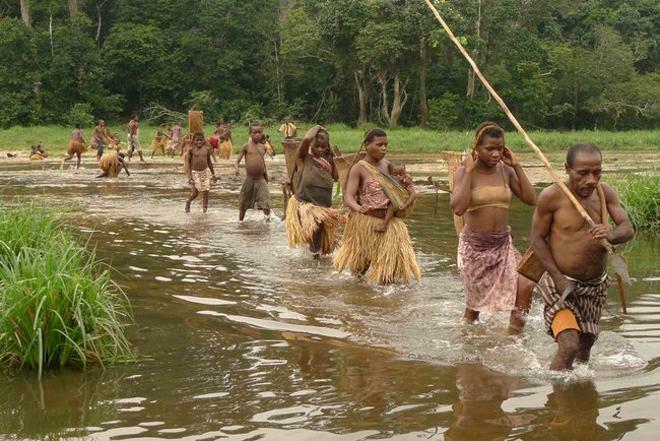 Potentially forced to leave their homes, the Bayaka attempt to protect their way of life. At its core this is a relatively enjoyable and well-meaning effort. The filmmakers do a nice job of highlighting the Bayaka culture in a natural way that never seems forced or exploitative. Likewise, the movie's central themes of listening, communication, and the pitfalls of modernity and industry are conveyed fairly well. There's even a few interesting editing techniques that contrast the natural world with the big city, and the overall visual style is strong, resulting in some beautiful imagery. 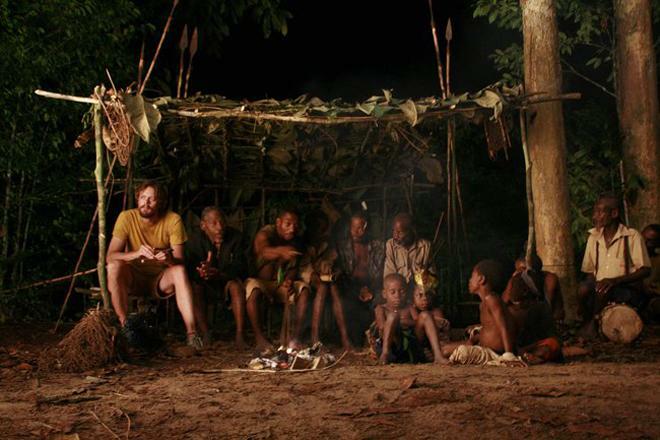 To this point, the runtime actually works best when the director simply focuses on quasi-documentary footage of the villagers living their lives and during extended scenes featuring nature shots that let the film's interesting sound design and images tell the story. When the characters decide to open their mouths and start talking, however, things get a little dicey. Unfortunately, dialogue comes across as a bit odd and unnatural, whether read through subtitles or even spoken by our American protagonist. Furthermore, actor Kris Marshall never really makes for a terribly compelling lead. Sure, there is some decent fish-out-of-water comedy to be had from his awkward attempts to fit into the tribe, but some of his line deliveries come across as affected and downright annoying. Similarly irritating, is the rather clunky and clichéd plot. The loose narrative features a hokey and inconsistent tone and the editing has a choppy rhythm, making it hard for the meandering story to really click. And the actual conflicts -- which mostly deal with a corrupt politician and a land dispute -- lead to very familiar drama and a rather uneventful conclusion. 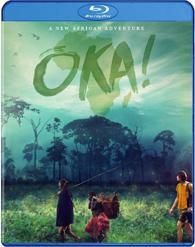 When it simply focuses on the wordless beauty and culture of its locations and people, 'Oka!' becomes a relatively engaging piece of cinema. Sadly, the movie's attempts at actual narrative and dialogue prove to be far too awkward, unfocused, and underdeveloped to work. The filmmakers do a commendable job of highlighting the Bayakas' way of life, but the runtime never really adds up to much. For those interested in learning more about Central African cultures this might make a solid rental, but while there are plenty of interesting sounds here, the script as a whole doesn't say enough that's worth listening to. Well Go USA brings 'Oka!' to Blu-ray on a single BD-25 disc that comes housed in a keepcase with a cardboard slipcover. After some fast forwardable trailers, the screen transitions to a standard menu. The packaging indicates that the release is Region A coded. The movie is provided with a 1080p/AVC MPEG-4 transfer in the 1.85:1 aspect ratio. Despite a few issues here and there, the film features lovely cinematography and a very solid picture. The source is in great shape with only a few negligible specks here and there. A natural layer of grain is visible, giving the image a pleasing filmic appearance. Though a little soft, detail is good and the picture offers a nice level of dimension, providing some depth to the beautiful nature footage. Colors are also solid, with lush greens, and appropriately rustic yellows and browns, fully bringing the African locations to life. White levels are bright, but black levels are sadly problematic with a noticeably elevated quality that gives shadows a milky grey appearance. This makes dark scenes look a bit washed out. Some negligible banding is also visible, but thankfully artifacts are not a major concern. With its impressive photography, 'Oka!' looks quite nice on Blu-ray, but some contrast issues do hold back the presentation. The film is presented with an English DTS-HD MA 5.1 and Dolby Digital 2.0 mix along with optional English subtitles. With that said, the movie also features a good amount of foreign language dialogue as well, and there is no option to just subtitle these portions. Instead, all speech, including the English parts, becomes subtitled, which can be a minor annoyance. The story places a large emphasis on sounds, and thankfully this mix features strong design work. Dialogue is clear and full throughout with no technical issues. The soundstage is wide and spacious with a pleasing sense of atmosphere. Sounds are spread naturally around the room with smooth imaging and directional pans (a plane passing by, etc.). Birds, rain, crickets, and other forest effects help to create a convincing environment that extends in all directions. A few city scenes also offer a thoughtful contrast, juxtaposing traffic noise with the more peaceful ambiance of Larry's new home. Music comes through with strong fidelity and separation as well. As one might expect based on the main character's profession, audio is integral to the experience here, and this track serves the movie very well. Trailer (HD, 2 min) - The film's trailer is included with Dolby Digital 2.0 sound. 'Oka!' is a well-meaning and visually splendid film, but its attempts at traditional narrative come across as hokey and meandering. While the movie's examination of the Bayaka culture can be interesting, Larry's journey is never as engaging as it should be. Thankfully, the video and audio mix are both good, conveying the film's lush cinematography and thoughtful sound design well. Sadly, the only supplement we get is a trailer. The runtime never completely comes together, but there's still enough merit here to warrant a rental.